It all looked like it fitted so neatly. The progression was perfect. Nico Rosberg winning three out of the previous four rounds. Nico Rosberg finally in Austria last time out beating his team mate in a straight fight. Nico Rosberg talking of developing his game; finding a missing piece. Nico Rosberg making a fight of the world championship. 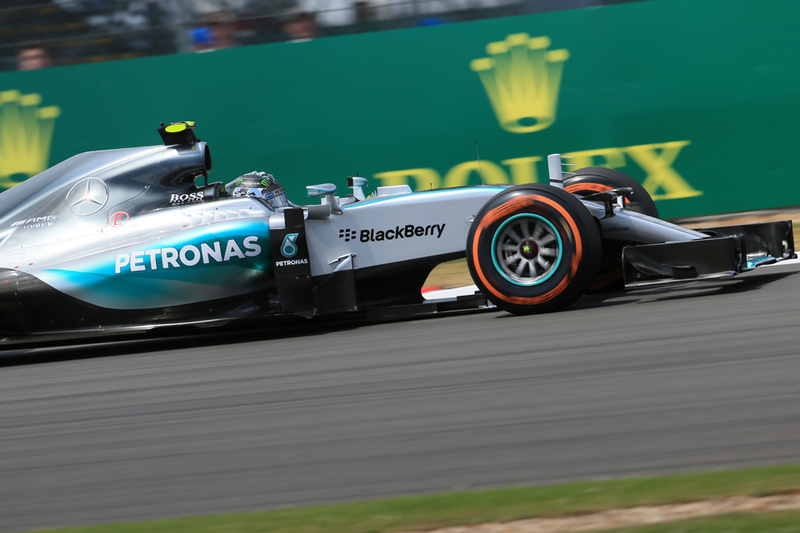 And Nico Rosberg being on top at Silverstone for this British Grand Prix weekend. And this rare loot to be claimed from his stable mate and chief protagonist Lewis Hamilton's very home patch of all places. It looked that way for the most part. In both Friday practice sessions Nico was well on top of Lewis and of everyone else, the impediment of the German missing much of the first one with mechanical problems swiped away dismissively. All the while he didn't even sound terribly pleased with how his car was handling, while Lewis had admitted that he was "in trouble" if he did not find "a lot" more pace. The Englishman was ahead in Saturday morning practice times but Nico had missed a lot of it with a gearbox oil leak. By qualifying the previous order indeed appeared to have been restored. In the first part Nico dipped under Lewis's best time by a clear 0.355 of a second, then in Q2 he remained ahead by a similar margin of 0.331. His advantage looked resolute and it looked like Lewis needed not so much to pull a rabbit from his but a succession of them. But if anyone in the modern sport is capable of wowing us upon shouting 'abracadabra' it is he, particularly when summoning urge for a single flying lap in the final gasps of a qualifying hour when it is likely decisive. And today he did it yet again right when it mattered. In Q3 Lewis somehow summoned up enough urge to tear eight tenths from his previous mark, and while Nico himself improved by around a third of a second the mathematics meant he all of a sudden was shy by 0.113secs. In a parallel with two weeks ago neither Merc bettered their marks in their final runs, though this time they at least didn't go through the rigmarole of leaving the track. Instead Lewis not improving aborted his lap while Nico also not improving at least completed his final tour but it did nothing for his position. Pole for the eighth time in nine this year therefore went to Lewis with Nico forced to gingerly line up next. 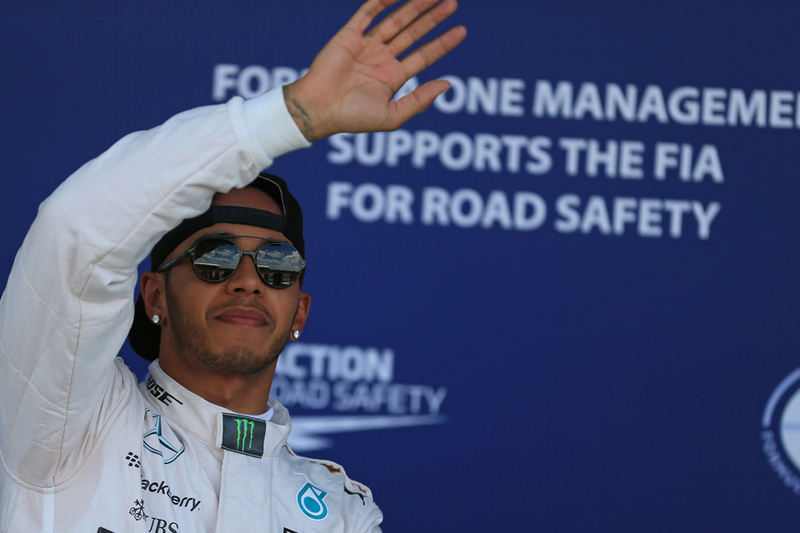 The oft-forgotten pole trophy could be officially all Lewis's before even the summer break. Furthermore now only two gentlemen by the names of Michael Schumacher and Ayrton Senna have more poles than him. Really with these numbers what Lewis did today shouldn't have been that much of a surprise. Nico meanwhile on his cool-down on his team radio lamented: "No grip on the left front - very strange". And while immediately after qualifying he explained that while his initial Q3 lap was good and Lewis's simply had been better (annoyingly - his word), the subject of his front left tyre was one that he returned to in regard to his final run. "The last run was something strange, nobody improved, or not many at least," he said. "There was something wrong with my left front - something was very wrong, we need to look into what it is." He later spoke of an engine problem too. "There are a few things. I lost quite a lot on straightline speed also, that is now the latest thing. So, a lot in that - and that was on my fastest lap." Lewis meanwhile gushed about his home triumph: "It's a special day, it's always special when you get pole on your home turf," he said. "It's been a bit up and down so far this weekend in terms of set-up and going into qualifying I made a change to the car that was not spectacular for one lap in qualifying but should be good for the race. "It made the races a lot harder last year to get past Nico to win - I did, but it was harder. So that [getting pole] was a focal point. "The support has been incredible every year. You know so many people spend a fortune coming here, and they are there to support you. You want to make sure you put the icing on top of the cake." Still, having Nico on top for pretty much all of the weekend aside from a madcap end to qualifying when Lewis pipped him should of course be familiar. It was the tale in Austria two weeks ago also, and we know how that one ended. A scarcely-credible Lewis special is much more doable over a single lap than over a race distance. But still some of the other parallels may nevertheless be not too encouraging for Nico. Just like a fortnight ago one-stoppers all round are expected tomorrow meaning his strategy options to get ahead are narrow, plus also like a fortnight ago this is a track on which overtaking, while possible, is no gimme. Of course in Austria Nico's superior launch turned the day on its head right from the get-go, but it's difficult to count on that every time. Especially given Lewis now has his old, preferred, clutch back. Things were brightened for Lewis further when he confirmed later that his tyres that he is to start the race on were not flat-spotted in qualifying, contrary to some reports. And if we add in a few more, possibly mire tenuous, parallels things get yet more tasty. Rather like his countryman Nigel Mansell for Lewis dramatic legend and last-minute savings-of-the-day seem quite his thing. And perhaps he produces them yet more readily at Silverstone. One way or another Nigel tended to win here too. Whatever is the case the grid seems tantalisingly poised. 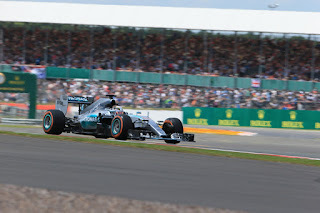 Once again the rest were mere things that made noise and indeed as was the case last year the Mercs appeared further away than usual at this fast and challenging track, this time even the best of the rest took the thick end of a second longer to complete the tour. The best of the rest appeared for most of the hour to be Valtteri Bottas in the Williams, but the Grove team just like those from Brackley had a last gasp switcheroo. Bottas was another not to improve on his final Q3 run and Felipe Massa almost from nowhere in what he called a "fantastic" lap pipped him for P3. 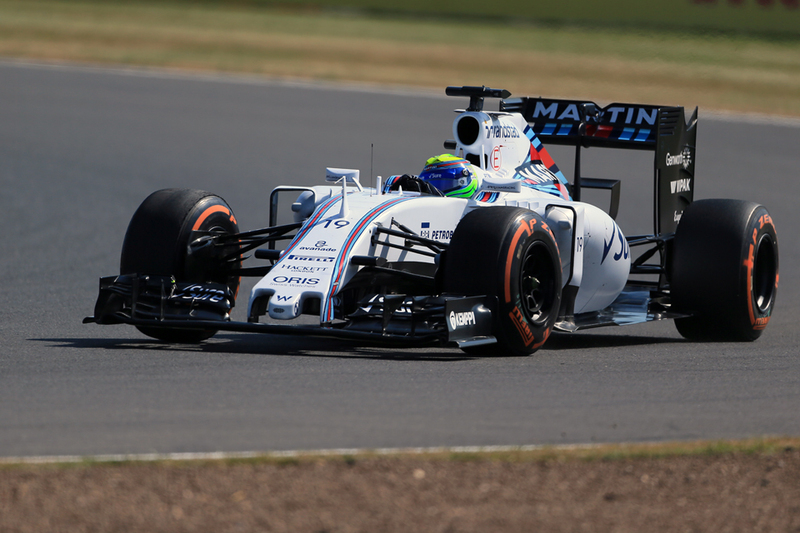 That's now 6-3 to Massa in that intra-team quali match-up this year, and he appears to be having something of an Indian summer in 2015. Whatever was the case Williams was clear best of the rest among teams, rather than the habitual occupant of that status this year of Ferrari. It's something that reflects well on the car's new higher-on-downforce package. 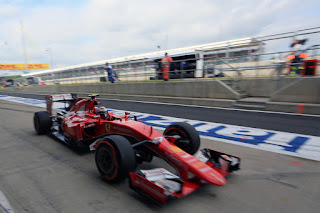 The Ferraris pilots haven't been terribly thrilled all weekend at Silverstone indeed and today again both spoke of the blustery conditions not suiting the car. 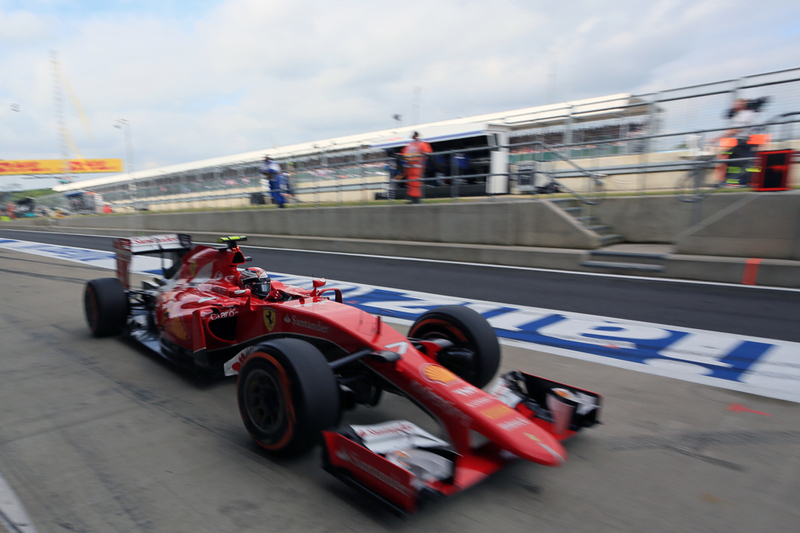 Sebastian Vettel said the Mercs that were more than a second better off were "in a different world". This time though Kimi Raikkonen qualified one place ahead of the two, in fifth, but he in a very real sense met with triumph and disaster and treated those two imposters just the same. "I've always said it [qualifying ahead of Vettel] doesn't make me any happier - I don't care if he's in front of me when we are in these positions [i.e. P5 and P6]" said Raikkonen. And by the same token he dismissed the notion that the Ferrari was gradually slipping away from the pace: "I don't think so - I don't see that we are sliding back. Every race is different. We didn't get exactly what we wanted today, but in these windy conditions we know it's not easy for us. But it's not like a disaster. There's no point to talk about if we are sliding back." But for all of his usual impassiveness Kimi was another to turn things on their head at the last, and in a way that was highly timely for him. Not only had he outqualified his team mate properly for the first time this campaign also the pair most commonly touted for his seat for 2016, in Bottas and Daniel Ricciardo, both sank behind their own team mates in the starting order. In Ricciardo's case the man himself said it was in part down to a track limits penalty and a lack of power compared with his team mate Daniil Kvyat which meant he was "bleeding lap time". The Russian meanwhile said his result of P7, to Ricciardo's P10, was "the maximum we could have achieved for today, I drove everything out of the car." Carlos Sainz was another deserving of a shout out as he qualified eighth, again ahead of his much-vaunted team mate Max Verstappen who admittedly was not happy with his handling. Sainz is another perhaps surprisingly 6-3 up on his team mate in the quali match-up this campaign, and one wonders if given our fascination with all things Max we are not giving Sainz sufficient due. Force India will also be encouraged that its 'B spec' car got Nico Hiukenberg into P9 on the grid and Sergio Perez P11. This on a track that the team was hopeless on last year and which tests the aero like few others do. 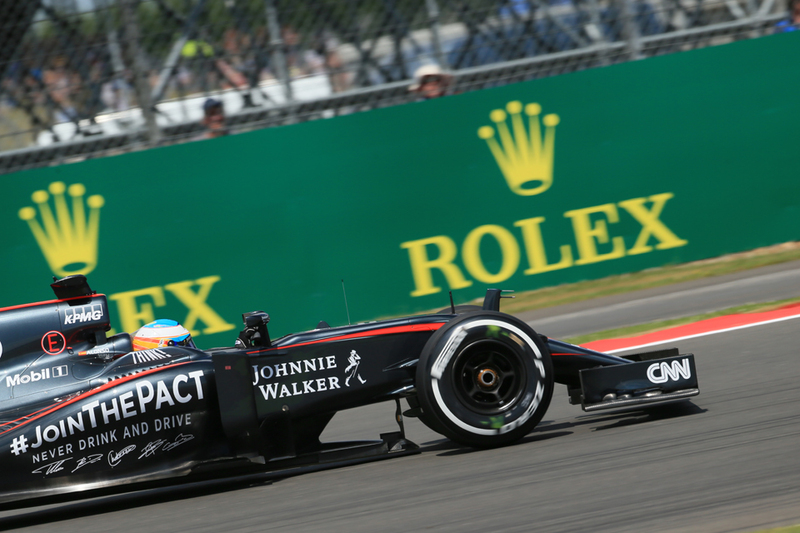 Encouragement was harder to come by at McLaren once again as both drivers got no further than Q1. Fernando Alonso found some though: "It sounds strange, but this is the best qualifying of the year for us" he insisted. "Being only 1.5 seconds off the leader [Raikkonen in Q1], on the new mediums as Ferrari had as well, and on the second longest circuit of the calendar." Some said that this 1.5 second gap can be entirely explained by deficit of the Honda unit; maybe so but the MP4-30 didn't always looked terribly happy in Silverstone's fast turns either. Alonso's comments afterwards that Spa and Monza are likely to be even tougher for the team weren't however the grand revelation that some tried to treat them as. 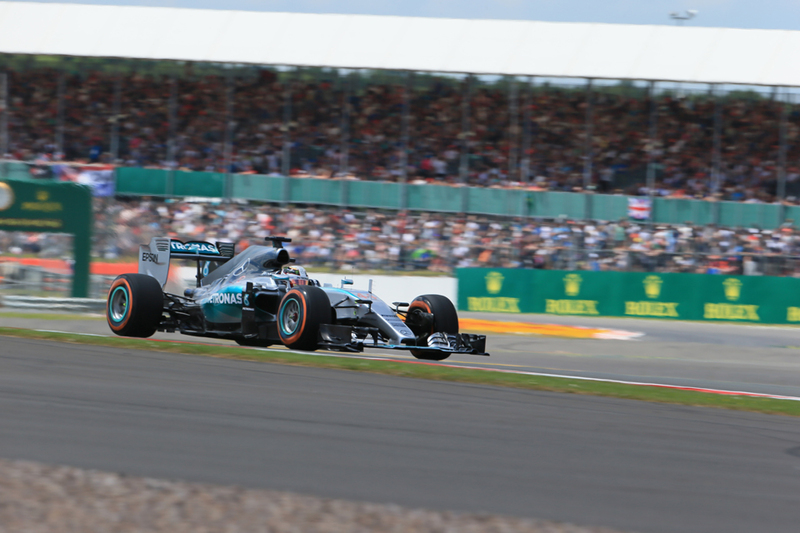 Neither is the Mercedes dominance at this tracks of all tracks a grand revelation. But not for the first time we can be grateful for the fight between the two with access to the mighty silver machines that will keep us occupied. Had Nico indeed got his pole today there may have been little in terms of a race tomorrow over first place. But he didn't get his pole, so a fascinating race may well be in store.